The Vox Valvetronix "Blue" Series amps not only have an innovative front end based on the proprietory Korg REMS preamp circuit, they also introduced the revolutionary hybrid Valve Reactor output amp circuit. 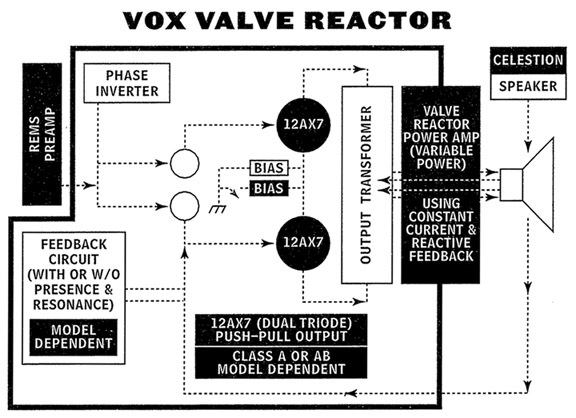 The Vox Valve Reactor has its origins in the Japanese keyboard design laboratory of Korg in the late 1980s. An electronic engineer at Korg started the development of a new hybrid power amp design. His concept was to develop a one watt power tube circuit to be used as the "driver" for a high powered solid state output stage. While this was a unique concept, it was shelved after some development. It just didn't sound right. More than ten years later, electronics engineer Steve Grindsrod left his position at Marshall Amplification, PLC to assume the head engineer position at Vox. After arriving at Vox, Grindsrod stumbled across the hybrid tube/solid state output circuit attempted some years earlier at Korg and felt that it had potential. After further R&D, the Vox Valve Reactor was successfully developed. This unique output circuit was incorporated into the new Vox "Blue" series. The "Blue" AD60VT and AD120VT amps were introducd in July 2001. By 2003, the original "Blue" series amps were replaced with a slightly updated design, the VTX Series. The new AD60VTX and AD120VTX combo amps were soon joined by two trapezoid amp heads, the AD60VTH and the AD120VTH. Matching 2x12 and a 4x12 enclosures were also offered. The details of the Valve Reactor circuit follow. The heart of the Valvetronix Valve Reactor power amp circuit is the 12AX7 "twin triode" tube. 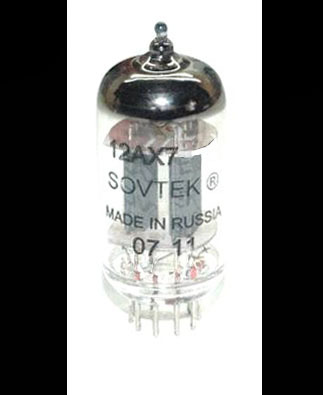 The 12AX7 has two complete amplification or "triode" circuits inside it's glass envelope. Ordinarily, these "twin triode" amplification circuits are used in series, or cascaded, in the gain stages of the preamp of a guitar amp. One would normally not expect to find a 12AX7 as part of an output amp. However, this is exactly how the 12AX7 is used in the Valvetronix Valve Reactor power amp circuit. Stated simply, the Valvetronix "Valve Reactor" circuit converts what would normally be a preamp tube to a one watt tube power amp. The output from this one watt tube circuit is then fed into a solid state amplifier to be boosted to a usable total output of 60 watts. The drawing at left shows the output from the REMS preamp stage being fed into the "phase inverter." The phase inverter splits the signal from the REMS preamp to supply the input signal to the to the 12AX7 power tubes. The one watt output from these tubes is then fed into an output transformer, just as one would find in a large tube power amplifier. It is this combination of power tube and output transformer that gives true tube tone to the VR circuit. After the variable power solid state amp boosts the output to 60 watts, two further interactions occur between the REMS preamp and the VR output circuit. These interactions further enhance the amp modeling of the REMS preamp. These interactions are explained as follows. Some amps use "negative feedback" to keep the output tube from distorting; others do not. The REMS preamp instructs the Valve Reactor circuit whether or not to apply negative feedback, depending on the amp model selected on the control panel. Additionally the REMS preamp instructs the Valve Reactor circuit whether it should bias the one watt tube as a "Class A" circuit (like a Vox AC-30) or "Class AB" circuit (like a Fender or Marshall amp) based on the amp model selected on the control panel . This further enhances tonal accuracy. Here are two views of the 12AX7 tubes on the chassis bottom of an AD120VTH amp head. It takes a bit of patience to remove these tubes for maintainence. They only protrude about a quarter of an inch from the bottom of the chassis, making them hard to grip. A view of the twin 60 watt solid state power amps in a AD120VTH. These are used to boost the one watt output from the 12AX7 power tubes to a usable 60 watt x 2 output. Large fins are used to dissapate heat and keep the amp output section cool. A rear panel rotary Power Select output power control on the AD120VTH allows the choice of 1 watt x 2, 15 watts x 2, 30 watts x 2, or 60 watts x 2. When 1 watt x 2 is selected, the solid state power amp is disconnected from the output circuit. You only hear the tubes. The VTX and VTH amps had twin speaker jacks are provided for each channel, along with an impedance selector switch. The inclusion of this switch allowed these amps to be capable of delivering their total maximum rated power to the speakers, regardless of impedance load. 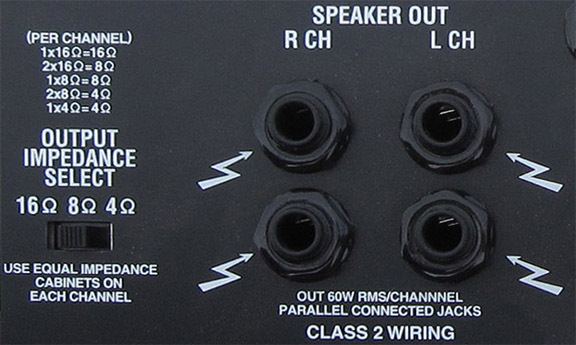 The VT series amps had a single speaker output jack and no impedance selector switch.